Samsung is quite serious in launching the smartphones of all ranges. Just recently, Samsung Galaxy A70 appeared on TENAA listings. Now Samsung Galaxy A70 debuts with 6.7-inch Infinity-U Full HD+ Super AMOLED display which also houses the fingerprint scanner. The phone has minimal bezels and a 20:9 aspect ratio. In terms of cameras, the Galaxy A70 has triple cameras on the back. These cameras include a 32MP primary sensor, an 8MP ultra-wide sensor, and a 5MP depth sensor. For selfies too, the smartphone uses a 32MP shooter. For its performance, the Galaxy A70 relies on an unknown octa-core chipset. Moreover, it comes in two memory variants; 6GB and 8GB of RAM. It features 128GB of onboard storage which can be expanded by up to 512GB using the dedicated microSD slot. The on-display fingerprint scanner also supports Samsung Pass which can be used to log into websites or protect app content and files or media stored on the smartphone. Samsung Galaxy A70 packs in a massive 4,500mAh battery which supports super-fast charging at 25W. 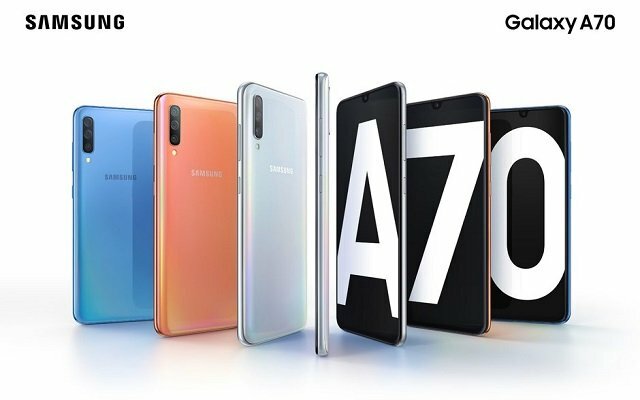 The Galaxy A70 comes in four colors – coral, black, blue, and white – and all of these have subtle gradients. Samsung has not revealed the price of the Samsung Galaxy A70. However, Samsung will do it at the event on April 10th. At this event, we also expect Samsung to unveil the Galaxy A60, which was recently certified by TENAA.